Move over, Ponch and Jon: CHIPs has nothing on Smith when it comes to helmet design. 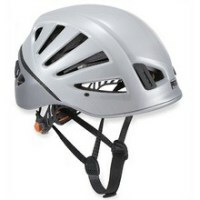 A lot of snow helmets these days look like rejected Borg technology, but Smith's Variant Brim is a smooth operator with a seamless melding of form and function. The ABS/InMold PC shell and EPS liner make an effective brain bucket that doesn't sacrifice comfort. The big plush ear covers and chin strap are comfy cozy, and if you start to overheat just pop open the 16-vent configuration. Straps are all adjustable for the perfect fit, and the goggle retaining strap will keep your eye pro strapped on. The Variant is available without a brim, but why go there? It cuts down glare, especially in low-sun-angle conditions, and it plain looks cool. Plus it adds authenticity to the CHIPs roleplaying the SheFlogger likes after hours... what, I was speeding? But I'm broke, how will I pay my ticket? Comes with a high quality helmet cover for storage. Brain buckets are a must-have piece of kit for most climbers, and Petzl has always been a leader in protecting your gray matter. The Meteor III is their latest and greatest entry into the gear fray, and chances are you'll either love it or hate it. First, the hatemonger perspective. Compared to the Petzl Elios the Meteor is slightly larger, awkward to adjust using one hand, comes in only one size and color and costs $30 more. Now, the love-in. 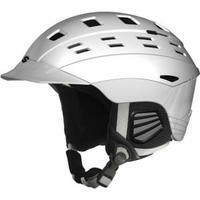 Again compared to the Elios the Meteor is significantly lighter (8.2oz versus 12.3oz), has better ventilation, has slightly more padding on the inside and has significantly more coverage of your brain housing group with the thick foam coming all the way down to the lip of the helmet a la bicycle style. In my opinion the lighter weight and increased coverage of the Meteor make it worth the extra money, and it has replaced the Elios in my gear bag. The marketing buzz is "more than just a foam helmet with a hard shell." Which is a little strange, because upon examination that's exactly what it appears to be. But as the kids say these days, whatevs. I find it hard to get excited about a helmet, although I'll give the highest praise I can think of to the Elios: I don't notice it at all when I'm wearing it. Petzl knows what they're doing with climbing gear, and there are many thoughtful touches on this helmet: one-hand adjustment of the headband, great ventilation and lightweight at about 13oz. It's also available in youth sizing, and with a face shield for use in ice climbing and, presumably, riot control applications.